We've made additional revisions to the Adjust template menu in the public website so you can further personalize and create style changes on your selected template. 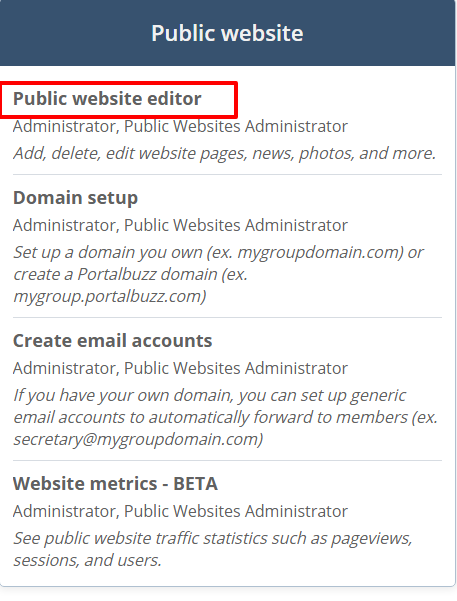 Click the Admin button on the navigation menu on the left. 3. Locate the Adjust template heading and click the Select button. On the H1, H2 and H3 Heading Style sections, you can edit the style, size and color of the fonts for the heading. On the Content Style section, you can update the style, size and color of the content of your public website. On the Link Style section, you can adjust the font color, decor and hover decoration of the links in your public website. On the Page Header Look section, you can upload your custom logo, edit the background and button color, and add custom text. You can also select from the available header images or upload your own image. On the Menu Look section, you have the option to adjust the look and style of the main menu and expanded menu. On the News Section Look section, you can personalize the title, background color, title color, sort news and adjust the news list limit. On the Search Engine Optimization section, you can add the browser title, keywords, a short description including a favicon. 4. After making the necessary adjustments, click the Save Adjustments button. Settings marked with the setting icon will be applied after they are saved, others will be visualized immediately. The SEO settings are not affected when you change templates or reset to the default template.